An expanded meeting of the Central Committee of Al-Baath Arab Socialist Party was held on Saturday, chaired by President Bashar al-Assad, the Party’s Regional Secretary. 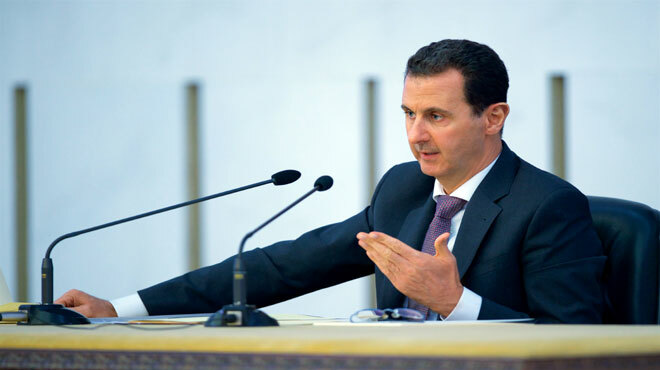 President al-Assad said that the war that is being imposed on the Syrian people for more than six years must be an incentive for Al-Baath Party to keep enhancing its presence among citizens by creating new mechanisms for communication that suit the current conditions and keep up with changes in the society, particularly since the Party was targeted since the beginning of the events in Syria due to its pan-Arab ideals, not just on the political level, but also on the level of media, but the true image of the Party has become clear after the truth became apparent to many and due to the Party’s performance during the past few years. His Excellency said that the states hostile to Syria used all its tools in the war against Syria, primarily the Wahabi and Muslim Brotherhood terrorism, noting that the battle between the Party and extremist currents isn’t a new thing; rather it dates back to the 60s of the 20th century. President al-Assad said that one of the goals of the war on Syria was undermining pan-Arab ideals and forcing Syria to abandon pan-Arabism, and he asserted that Syria belongs to the Arab nations therefore these attempts failed, affirming that Al-Baath Party has an important role in consecrating Syria’s Arabism due to its belief that Syria is the basis of Arabism. His Excellency stressed the need for Party leaderships to find new ideas and work methods to revitalize the Party’s work, thereby holding constructive dialogue with the members of the Party and strengthen them, calling for devising programs that address the new generations and develop the Party’s ideals in order to protect these generations, enhance their sense of patriotism, and involve them in making programs and work plans. President al-Assad said that it’s important for the Party’s leaderships to encourage the spirit of initiative in Party members in all fields, not just in party work, which must be conducted on the ground and be in touch with the people rather than being limited to deskwork or paperwork, adding that it’s not enough for officials to conduct field tours, as there must be clear work mechanisms linked to these tours and their effectiveness. His Excellency reviewed the developments in Syria, saying that the recent US strike on al-Shairat airport came after the defeat that terrorists suffered in Hama and the advances made by the Syrian Arab Army in the north and the east, noting that Western states with the United States at their head interfere in favor of the terrorists whenever the Syrian Arab Army makes a significant advance. President al-Assad affirmed that war on terrorism will not cease as long as one terrorist remains in Syria, and at the same time Syria will continue to confront Western scenarios seeking to undermine its unity and sovereignty, and this will be done in conjunction with pursuing political work, both in terms of the reconciliation policy that proved effective, and in participating in the political process in Astana or Geneva in the hope that this would help stop the shedding of Syrian blood. Participants in the meeting raised a number of ideas and discussions, and President al-Assad addressed the members’ queries about the performance of the Party and the political situation. A new Central Committee was also formed during the meeting and changes were made to the formation of the Regional Leadership and the Party Supervision Committee.